Proving compliance isn’t always an easy task. Gathering the detailed information needed from across the enterprise, pulling from a range of resources and disparate systems can be confounding. Coordinating reporting and matching it back to the requirements – some of which change frequently – can be time consuming if you don’t have the right visibility. More systems, more data. The complexity of technology is always increasing, but budgets and staff sizes never seem to keep up. And compliance regulations seem to evolve just as quickly, leaving IT, security and compliance teams constantly struggling to meet baselines, let alone get ahead of those basic requirements. Constantly reacting to compliance mandates or updates to the requirements can seem exhausting, and most teams don’t have experts on staff. Imagine feeling secure in the knowledge that you’ve got access to industry or regulation experts who can do more than just keep you compliant, they can help you get ahead of compliance challenges. Visibility is the key to continuous compliance. You need to be aware of how your organization is handling data, whether it’s at rest or in motion, and able to prove compliance at any point. Regardless of the technology in place, IBM® provides security and compliance that follows your organization’s rapidly growing amounts of data throughout the lifecycle, no matter what type of data it is, or where it lives. Solving for complexity is something IBM understands well. We’ve helped clients across industries simplify and automate their compliance process to create compliance solutions that meet extreme needs for scalability and flexibility. With a technology-agnostic approach and a team of experts, we can help you solve your compliance needs. Organizations that excel at compliance stand apart from those who just meet baselines. When compliance is part of your strategic plan, your organization spends less time reacting and more time leading the competition. IBM’s expert-led services help organizations improve, automate and anticipate compliance activities for a competitive advantage. A comprehensive data protection platform to automatically analyze events, ensure data integrity and automate compliance controls. Protect sensitive data and enforce corporate security policies with a data protection strategy and risk mitigation. Automatically monitors access to data sources, automates compliance controls, and protects sensitive data. Optimize your security program with an integrated framework of solutions, systems integration and managed services. Better manage your risks, compliance and governance by teaming with our services experts. Endpoint management and security to help cut operational costs, compress endpoint management cycles and enforce compliance in real time. A security intelligence platform to detect advanced cyberthreats fast for actionable insights, identifying top threats and reducing alert volume. Provision, audit and report on user access and activity through lifecycle, compliance and analytics capabilities. Silent security with identity and access management solutions for today's hybrid environments. 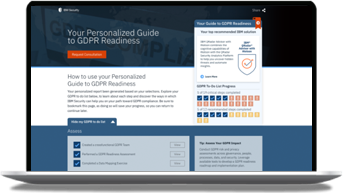 Is your business meeting GDPR requirements? Check your status against IBM checklist to assess the readiness of your organization. Compliance requirements change quickly and can have a big impact. Do you have the right strategy for continuous compliance across your organization? IBM compliance solutions provide the visibility you need with greater efficiency to help you maintain continuous compliance and build customer trust. Technology complexity makes it challenging to achieve compliance efficiently. Learn how to cut the clutter and simplify the process.